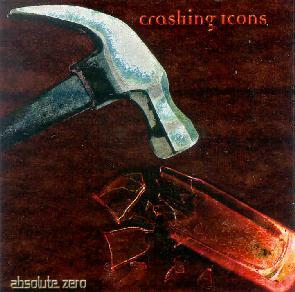 Absolute Zero - "Crashing Icons"
With roots going back to the late 1970's, Absolute Zero play a highly energized and complex (yet accessible) brand of avant-rock. The core of the band is the trio of Aislinn Quinn on keyboards, percussion and vocals, Enrique Jardines on bass and percussion, and the great Pip Pyle on drums and percussion. For those of you not in the know, Pyle is a key Canterbury figure having played with Hatfield And The North, National Health, In Cahoots, and of course a stint with Gong. Additional contributions come from guests Keith Hedger on trumpet and percussion and Jim Stewart on percussion. Crashing Icons is their second release. From the opening track, "Bared Cross", several influences can be heard in Absolute Zero's music. Jardines bass reveals a clear Magma influence, and both he and Quinn's keyboards crank out lines that perform a guitar role, giving the music a powerful rocking edge. The music transitions smoothly between wildly chaotic jams and intense orchestrated segments, and hints of free-jazz are apparent too. For the more song-oriented portions of the music Thinking Plague and 5UU's immediately come to mind, and Quinn's vocals sound very much like Bob Drake. On the lengthy "Further On", busy crashing percussion is at the forefront of the intro section accompanied by a repetitive bass pattern. Keyboards soon join in along with more of Jardines guitar-like bass for a brief but killer jam that soon leads into the more composed portion of the track. Throughout its 20 minute length the music moves through a parade of themes that illustrate the bands impressive compositional skills and ability to transition seamlessly from intense jams to quieter but equally intricate orchestrated segments. I loved the dark and freaky atmospheric finale. Argento might hire these guys over Goblin for his next film. It's hard to imagine that only three musicians are performing the bulk of this music. "Stutter Rock" and "You Said" are actually two parts of one track. It's a heavy driving rocker with potent bass patterns and a jazz slant provided by Keith Hedger's trumpet. The intensity level and avant-rock style reminds me at times of Present. Finally, "Suenos Sobre Un Espejo" creates a spooky atmosphere with ghoulish growling voices. But the track also includes a free jam that has a quirky carnival-like feel, a song section that has a strange Tango sound, and loads more. It's hard to describe but this is a good fun tune that demonstrates Absolute Zero's skill with imaginative structures and thematic development. In summary, Absolute Zero's sound may not be unique, but I enjoyed the synthesis of related influences, the musicianship is top notch, and the compositions and frenetic musical constructions kept me riveted throughout. Highly recommended to fans of the avant prog rock and Canterbury scenes. For more information you can visit the Absolute Zero web site at: http://www.absolute-zero.net. Contact via snail mail c/o Absolute Zero; PO Box 144737; Coral Gables, FL 33114.